It was three years ago in Bern, Switzerland, that acclaimed British pop musician Conrad Lambert, known as Merz, met Swiss drummer and sound artist Julian Sartorius. Sartorius was drafted in as percussionist for Merz‘s album «No Compass Will Find Home», “A rewardingly challenging folktronic affair that covers huge thematic and sonic territory” wrote The Sunday Times in their Album of The Week review. An album containing “consistently thoughtful songwriting” according to The Guardian. His richly detailed and expansive songs have now been reconstructed. 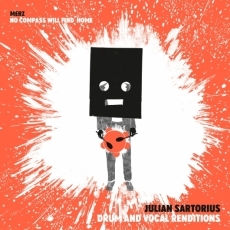 At the hands of 32 year old Julian Sartorius this companion album «Drum & Vocal Renditions» reduces as well as radicalises «No Compass Will Find Home», Sartorius applying the same rules and operation methods to Merz‘s song variations as his epic audio-visual «Beat Diary»; no electronic effects appear on the ten renditions, overdubs are used but every beat is actually played, every sound is real. «Drum & Vocal Renditions» is primal, «uneasy listening»: a variety of percussion instruments combined bring out the sound-base for quiet goat bells arising here and there, gongs, an Mbira out of the dark and drill-machine-like toys, while Conrad Lambert’s untouched vocal tracks provide a sort of compass on the way through the woods. Incidental sound miniatures serving as stabilizing elements help guide the listener en route through these previously unexplored soundscapes, making this first collaboration of the two artists’ labels (Matthew Herbert’s Accidental Records and Everestrecords) into a noteworthy happening.